# Sanity check: confirm that this version of Perl really is op_mask aware. that comes with the distribution of the Safe extension to Perl. # Share STDIN and STDOUT but no other filehandles. # Share %ENV so that the script can see our environment variables. # Share $" so that they can interpolate arrays in double-quotish contexts. then any URL with the extension .mypl will invoke this helper application, which will compile and run the script within the Safe compartment. Create a new Safe object (compartment) using $cpt. Open and parse an optional .helper.privs file to give the user some flexibility in configuring the Safe compartment. Be very careful about using this option. Make quite sure you understand exactly what you're permitting before you make an entry in this file. Share the STDIN and STDOUT file handles, and the %ENV hash into the safe compartment. Execute the downloaded script, within the safe compartment, using the Safe::rdo() method. Check $@ for any runtime errors during the execution. Using this technique is certainly preferable to nothing at all, but it still isn't foolproof. If the user incorrectly configures his or her .helper.privs file to allow an unsafe op like fork() or open(), it can lead to trouble. Make sure that you, and/or the user, fully understand how Safe works and the implications of each opcode before configuring any additional permit()'d operations. This script would have run just fine if you hadn't set up a Safe compartment. 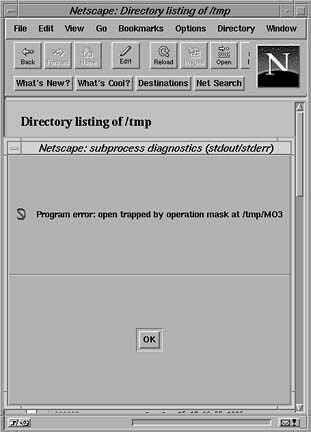 Since you did, though, the script won't run, and Netscape will give you back an error dialog that looks like Figure 15.3, indicating that the open() operation wasn't allowed. Too bad for darkman. Figure 15.3. A Safe error message.